We have the best staffers at our stations! They really go above and beyond to involve themselves in the environment and to inspire others to do the same. 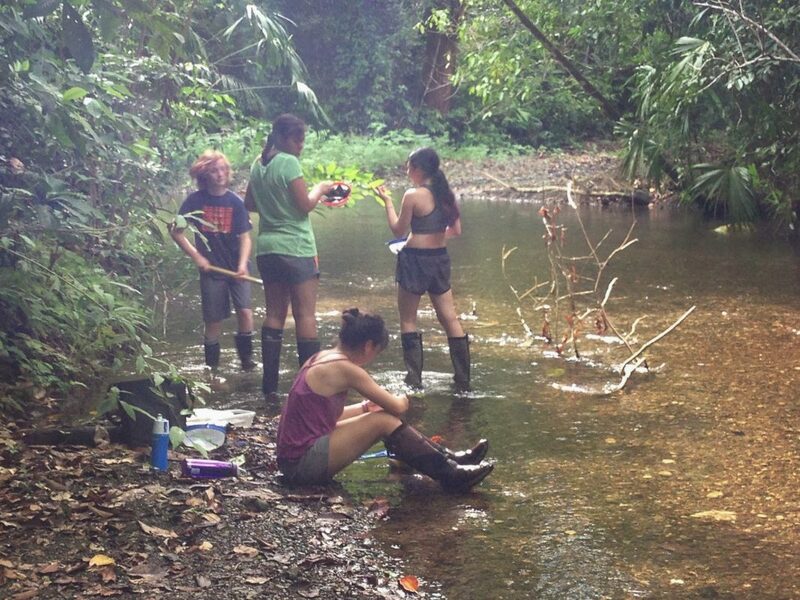 Osa Conseravation enables high schools, universities and school groups to learn, hands-on, in our field courses. 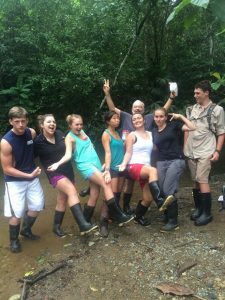 Students get an amazing chance to actively learn important lessons with dedicated researchers in the paradise that is Costa Rica! Read below for the unique perspective of an OC Resarch Field Assistant leading these educational excursions. One of the greatest pleasures of working at Osa Conservation is being able to inspire the young school groups that visit. 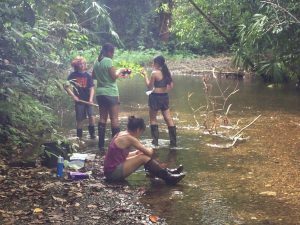 Students from all overcome to Osa to learn about environmental science and conservation, and there is no better way to learn about these things than through hands-on methods in the field. Osa Conservation provides these students the opportunity to do just that. We conduct workshops with the students, providing them with the necessary background information about the different systems we have here in the Osa. We teach them sampling methods and teach them theories and principles to allow them to form their own conclusions using the data they collect. One such system that we extensively study here are the different watersheds in the peninsula. Before heading into the field, I give a presentation in the lab on the different variables we measure to determine water quality and overall watershed health. We go over the appropriate methods and discuss why watersheds are important and the broader impacts they have on the ecosystem as a whole and to humans who drink this water. Then we head into the field. After strapping on our boots, we tromp through the jungle to a nearby river. Here, the students get the chance physically implement the methods we discussed in the lab, measuring variables such as the amount of dissolved oxygen in the river, the pH of the river, and the amount of suspended solids in the water. After measuring the chemical and physical properties of the river, we do a macro-invertebrate survey. These animals are used as bio-indicators of the quality of the water as certain species can only survive in certain quality of water. It is by far the students’ favorite part. I pass out sieves and nets and the students are unleashed into the river to sample all the micro-habitats within the river to catch as many macro-invertebrates as they can. They excitedly exclaim “I’ve got something! What is it? It’s jumping!” We collect all the samples in buckets, physically sitting in the river as we do so, and go through and identify their findings. Throwing back the non-invertebrates, like tadpoles and fish, we keep the snails, shrimp, and insects like dragonfly, caddisfly, stonefly, beetle, and mayfly larvae. The presence and absence of certain species then indicates the health of the river ecosystem and the quality of the water. By the end, we’re all soaked from head to toe, but the students are always reluctant to go back to the station. Through these workshops, they learn valuable field methods, but mostly, they gain a deep appreciation for nature, the interconnectivity of different ecosystems, and the impact humans have on them. Though not all of the students want to become conservationists or scientists when they get older, by giving the kids an opportunity to interact with an environment they would otherwise not have access to, we are inspiring the generation by educating them about these crucial issues.